The market selloff over the past week has left many pundits scratching their heads. While reasons abound; trade, tariffs, rising interest rates, soft global economy, Italy… none of them are new. They have all been on the horizon for months if not all year. The question that is more appropriate is not “Why?” but “Why now?”. Every time the idea that this bull market is over comes to the forefront, I have been quick to remind that the bull market is based on one thing, and one thing only. The ability of this economy to continue to generate growing earnings for the majority of companies that have publicly listed stock. Period. Things like interest rates and tariffs do matter, but not in and of themselves. They only matter to the extent that they can impact and reduce corporate earnings. But the economy is affected by hundreds, if not thousands, of events on a daily basis. Adding millions of workers to the labor force has been a powerful stimulant that has offset much of the headwinds. The trick then is to determine the net affect that they all have in sum on corporate profitability. No easy task. So why now? My guess is that with third quarter earnings season really kicking off today, investors just got nervous that a small hiccup could wipe out the years gains in many of their holdings. No one ever went broke taking a profit. No reason to turn paper gains into paper losses. With solid earnings today, led by a solid beat by J P Morgan, a bit of rationality has returned. This economy is strong. A recession is not in the cards. Does that mean more double digit returns for the market? Not necessarily. Zack’s estimates that this years earnings growth will be in the 17% range, dropping to under 10% for 2019. If the Fed keeps raising rates, Europe, Japan, the emerging markets can’t get their economies going, a trade war, maybe throw in a European financial crisis, and the result is that the U S market will be in far more jeopardy if growing at a 9% earnings clip than a 17% rate. Bottom line: What we have seen so far in October might be the “new normal” for the market in 2019. Are you ready for that kind of ride? As an investment advisor I make my living by investing on behalf of my clients. The better the economy, (more often than not) the better the stock market performs. The better the stock market the better off all of us investors are. From a social aspect, the bigger the economy the more money for the Federal budget – whatever your preferences may be; military spending, infrastructure, health care, trade… The more revenue generated through economic growth, the more we as a nation can accomplish. Currently there is just no denying that economic growth is stronger than it has been in decades, and despite warnings to the contrary, it is showing signs of further acceleration. Bull markets can end for a number of reasons, but a recession is not one that we face in the near future. Negative investment news persists regardless of economic reality. The market is going to crash because: N. Korea, Iran, trade wars, tax cuts, rising interest rates, or just simply because it’s been going up for too long. Bull markets end because the outlook for earnings growth deteriorates. Period. Earnings can decelerate for a number of reasons. A cyclical economic slowdown (old fashioned recession), a financial crisis (worries are brewing), or an exogenous event (9/11, major natural disaster, war…). While an exogenous event is unpredictable, there are warning signs to watch for, for the first two. Let me address a couple of the theories that abound that we are heading for an economic slowdown. We import more than we export. The US not buying goods from other countries will hurt them much more than other countries not buying goods from us. Virtually everything we import we can make ourselves, it might cost more, but also creates jobs. President Trump is counting on this very simple reality to reverse a trade policy that was created to address global reconstruction after WWII. By negotiating one on one with our trade partners, he feels we can “normalize” policy to one that puts us on a more equal footing with our partners. Do we really still need to be protecting German manufacturing by allowing tariff’s on our goods? Bottom line is that agreements will be renegotiated because it is in everyone’s best interest to do so. China will come along slowly. If they want to play with the big boys (membership in the WTO) then they need to act like a grown up, not a 5 year old begging for a candy bar handout at the grocery store. Stealing intellectual capital is not a grown up world activity. Yes there will be some disruptions, some winners and some losers but the overall economic effect will be nil. If you don’t want to read company reports and financial statements to determine the cost of higher tariffs, then just avoid individual stocks for now. There are plenty of ETF’s to offer enough diversification to circumnavigate the Harley Davidson’s (HOG -13.04% YTD, 8/28/2018). Try IYT, the iShares Transportation Average ETF, +7.33% YTD. So how is it that this recovery is on its last legs? Yes, we could be getting close based on the 1962 recovery, but we could also only be ½ way there based on the 1970 recovery. Are you really willing to sit in cash knowing that historically GDP could still double from here? Invest, because that is what investors do! Understand the need for an exit strategy now? If you don’t have one be very certain that the day I say “I told you so” will come! Better idea – send us a message and we can help work some strategic planning into your retirement portfolio. While we are in the midst of the summer doldrums for the market, I thought the timing was good for an update on some changes at 401 Advisor, LLC. First I’d like to introduce and welcome Jim Kilgore to the team. Jim served on active duty in the United States Air Force for 20 years and retired in 2014. His passion for investing has led him into the financial services industry. In a short span Jim has accumulated an array of skills in the financial services industry. He has spent time with an investment advisor that was also involved in the property and casualty insurance industry and will use this experience in working with Greg Fay, owner of Greg Fay Insurance who works here in our building on Franklin St. He will also complete his tax preparation certification that will enable him to work with and provide tax advice while working with the professionals at P&A Tax Services, (also located here at our location) and other tax advisors as well..
With Jim’s addition and skills we will be able to offer clients a values based financial/wealth planning service above what we have offered in the past. A special interest for Jim is a focus on families with a special needs family member. In Jim’s experience special needs financial planning is unlike the traditional “Money Magazine”-style financial planning where you buy a home, raise your children, plan four years of college education and retire. Special Needs Financial Planning is preparing for two generations. 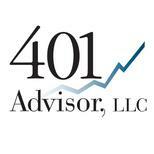 Once the planning is in place, 401 Advisor’s fiduciary commitment fits perfectly with the responsibility to properly manage financial assets in meeting both the parent’s goals and providing for the lifelong needs of their child with special needs. If you are interested in a comprehensive financial evaluation, give either Jim or myself a call and we can discuss how we may be able to serve you best. Jim currently holds series 6, 7, and 66 securities licenses. Additionally, Jim holds his life, accident & health as well as his property & casualty insurance licenses. Jim is active in several non-profits and volunteers with his family in many community projects and activities. When Jim is not working, he enjoys fly fishing, hunting, and playing golf. Jim, his wife Laura and six children live in Springboro, Ohio. Second, at the suggestion of a client, I have added a client only, password protected page to my website, http://www.401Advisor.com. The purpose of the private, client only section will be to offer specific commentary on our strategies, holdings, and rationale behind changes. More generic commentary will continue to be posted here at http://www.deshurkoblog.com. For those of you who have wondered about a holding or a strategy but didn’t want to call and ask or make an appointment, the new addition will hopefully be a welcome way to stay informed. I’ll also be able to add any office related information that would be of interest to clients of the firm. As always, if you have any questions or concerns please contact Michelle@401advisor.com, myself at bill@401advisor.com, and now Jim at jim@401advisor.com. Or call us at 937.434.1790. Not that we have seen the last of market volatility for the year, but the recent “correction” has shown us three things. When the market has a particularly outsized gain or loss the pundits come out of the woodwork to pitch their explanations. Usually, it’s pretty hard to tell myth from fact. What story is real vs what story just sounds good enough to get TV face time. Not so with this recent hissy fit. There was a consensus that fears of a trade war set the market off on its downward trajectory. The new Director of the National Economic Council, Larry Kudlow came out and explained on Fox Business News, that this was not the start of a trade war with China. It was the start of negotiations with China to end their trade abuses. Including but not limited to theft of our intellectual property, technology and onerous tariff’s on goods imported from the U S. The DOW saw its biggest single-day point turn around ever. This is good because knowing that the market is focused on a single issue, not an overall fear of the economy misfiring, should clear the way for a solid earnings rally in a few weeks. And third, this market will shoot first and ask questions later. Regardless of day to day direction, it is no indication of future results! We are currently in a trendless market, looking for a solid reason to go up or down for the smallest of reasons. There’s nothing like a 700 point drop on the DOW to shake things up a bit. Not emotionally immune to this kind of market behavior I had to look for some confirmations that Thursday’s drop was within “normal” volatility range…or if not prepare to take some portfolio management steps. I often make fun of our industry when we predict the future, and when our predictions come true (it does happen once in awhile) we act as if we were totally blindsided, with no rational explanations. In this case, I have to laugh at myself a bit. In my beginning of the year “prediction” blog post, I posited that we would see increased volatility this year, with positive breaks during earnings season, as long as earnings managed to meet or exceed expectations. With +/-2% days being more frequent, let’s hope first-quarter earnings reports can pull the market back up. We should know in a few weeks. I am a believer in using technical analysis for short-term trends. Whenever I want a view of the health of the market, I pull up a chart and apply a few indicators. Today I didn’t have to do much. Below is a chart of SPY, the S&P 500 Index ETF, with trendlines that I had drawn in months ago. Simply, the SPY has hit the bottom trend line and, as of 10:25 AM on March 23rd, appears to be bouncing back up into the trend range (defined by the two parallel straight lines). It is also easy to see the market volatility before and after February’s large drop. The point? As of now, the market is not doing anything unexpected, but it is very close to crossing down into the danger zone. If the market reverses down today or posts a couple negative days at the beginning of next week, it may be time to start putting the defensive team on the field. Hopefully, with a few up days, the market runs up to the top line, and with positive earnings, crosses through and above. If you don’t have time to read all 20 tips, you can go right to Tip #8 for the best advice! While we wrap up another year it is time once again to throw out the traditional “Forecast” report for the up coming year. But before we look ahead we do need to do a quick review of some of the relevant details from 2017. Many pundits and articles are predicting a fairly imminent correction because the market valuation is at record highs. First a quick primer, when valuations are mentioned, unless stated otherwise typically refer to the markets Price to Earnings ratio – simple dividing the markets “price” (I am using 2700 for the S&P 500) and the sum of the earnings for the constituent companies. The market valuation is based on (anticipated) corporate earnings, specifically the growth rate of said earnings as the market is forward looking. Below is a chart from Ed Yardini & Associates blog that shows the level of corporate earnings since 2003. While much has been made of the low volatility, high growth stock market in 2017, such a year is hardly surprising when looked at while comparing to earnings growth to recent years. 2017 earnings, both anticipated and actual, have accelerated sharply from flat growth in 2016. While the “P” or price of the S&P 500 has risen sharply, so have earnings. Below are the projected P/E ratios based on a level 2700 for S&P 500 and consensus projected earnings and earnings growth rates from http://www.YCharts.com. While pundits like to cry that the sky is falling…it makes great headlines, the fact is that the market valuation is getting cheaper, not more expensive. If we maintain the current valuation or P/E then based on earnings projections the market can appreciate by 11.2% and 9.9% in 2018 and 2019 respectively. Granted earnings projections are guesses, but the market moves on those guesses, and will correct as necessary when actual results are disclosed. As far as I have read earnings projections have not factored in the economic boost from the tax packages being proposed. Any economic boost from tax cuts could serve to bolster stock returns or bring down the market valuation. However expect a return of normal volatility as earnings projections will be difficult with simultaneous fiscal stimulus and Fed tightening. Looking at the chart below it is easy to see that 2017 was a much less volatile year than 2016 for the market. The top and bottom white lines showing the price range for the SPDR S&P 500 ETF (SPY) in 2016 and the two middle white trend lines showing the price volatility for 2017. In 2018 expect at least one 10% decline through the year, if not more. Do not be scared out. Remember that historically 10% declines are normal every year! With the magnitude and timing of the effect of tax cuts expect that earnings estimates will be far less accurate in 2018. The market trades on earnings and uncertainty will create volatility, but an overall positive return in 2018. In the latter part of this year short term interest rates have moved up coincident with the Fed’s tightening. The black area showing where rates have come from and the red line depicting current rates. Interestingly, long term interest rates have come down, beginning to move toward an inverted yield curve. When truly inverted short term rates are actually higher than long term rates. Such a setup typically precludes an economic slowdown, possible recession and a bear market or serious correction. My feeling is that the yield curve will continue to flatten in the first half of the year with short term rates rising and long term rates flat or falling. But by the end of the year the curve will start to normalize with long term rates reversing course and heading up as the positive affects of tax cuts, and possibly Congress re-looking at Obamacare. This is one the only time that I can recall that fiscal and monetary policies are in synch… by moving in opposite directions. While Fed tightening alone would likely cause a recession in 2019 as indicated by the yield curve, fiscal stimulus via tax cuts will (hopefully) offset Fed action and keep the expansion going. Without tax cuts a recession is a strong probability. But the Fed does need to normalize rates. With 3%+ economic growth short term rates should be significantly higher. Besides being irrelevant, it is far from accurate. Secular, or long term cycles have defined the stock market since its inception. In the modern era, a bull market started in 1940 during WWII and didn’t end until 1965 – 25 years later. More recently the biggest bull market yet, started in 1980 and finished 20 years later in 2000. From 2000 to 2013 the market was stuck in a 13 year secular bear market, punctuated by two separate 50% declines. A secular bull market is defined as one in which the start is when the market reaches a new all time high…and stays there. By that measure, this secular bull started just 5 years ago, short by any measure. While true that bear markets begin at extreme valuation levels, as pointed out earlier, valuations are trending down not up. Although U S earnings growth rate may be slowing, globally the earnings expansion is still early. In the U S earnings will depend on who wins out in the tug of war between Fed policy of rising interest rates (negative) vs. fiscal stimulus of tax cuts (positive). By 2019 my money is on the fiscal stimulus prevailing. The first rule of successful investing is to determine what you will do if you are wrong. The worst investment mistakes many times come from being so over confident in an investment that the investor doggedly sticks to it even when expectations are not being met. Even with what may seem to be an obvious trade, there are always exogenous uncontrollable events that can sink the best of plans. With what I anticipate to be a rocky road in 2018, if you are risk adverse you may want to stick with lower volatility investments. The other strategy is to focus on long term trends that can prevail regardless of the results of government policies. Robotics, artificial intelligence, data use and collection are unstoppable trends. Health care has not had an overall good year in 2017, but globally the developed world is aging and money will continue to be spent to prolong and increase the quality of life as we age. Wile this doesn’t mean such investments won’t be volatile, they are industries that will grow over time.